The perfect side dish for your Easter dinner! Heat large covered saucepot of salted water to boiling over high heat. Add green beans and cook 2 minutes. 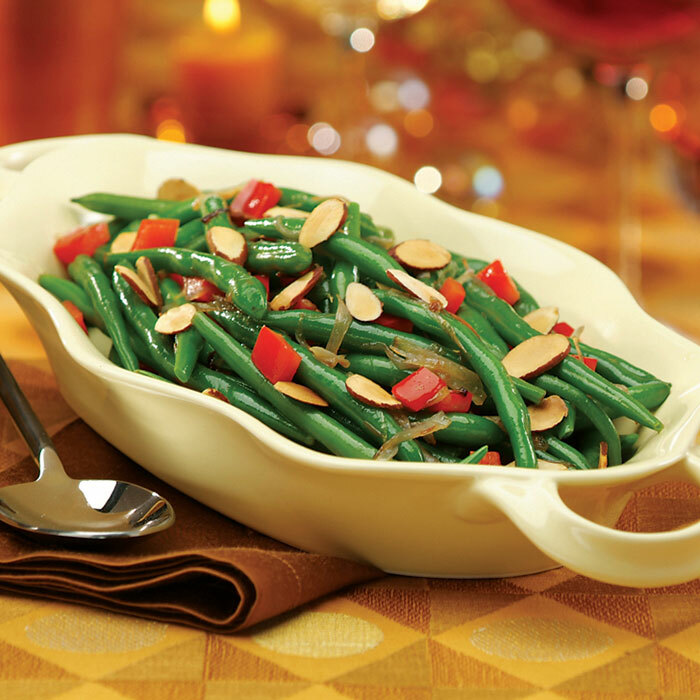 With tongs, immediately transfer green beans to large bowl filled with ice water. Once cooled, drain green beans. In large skillet, toast almonds over medium heat 13 to 15 minutes or until lightly browned, stirring occasionally. Meanwhile, in large saucepot, melt butter over low heat. Add shallots and cook, partially covered, 30 to 35 minutes or until golden brown and tender, stirring occasionally. Increase heat to medium-high. Stir in green beans and red peppers. Cover and cook 4 to 6 minutes or until beans are tender-crisp and heated through, stirring occasionally. Remove saucepot from heat; toss with almonds, vinegar, salt and pepper.